Prime Minister Justin Trudeau meets with U.S. President Donald Trump today. Canada and the U.S. have knitted together one of the world’s most integrated economies since signing free trade agreements 30 years ago, trading everything from fertilizer to oil, auto parts to drugs. As Prime Minister Justin Trudeau heads to Washington to meet President Donald Trump today, Canadian companies are hoping it doesn’t all unravel in a trade war. Trump’s pledge to renegotiate the North American Free Trade Agreement and his support for a “major border tax” threatens to disrupt $541 billion U.S. ($707 billion) in trade between the two countries, potentially driving up costs and crimping profits for some of Canada’s biggest companies including Suncor Energy Inc. and auto parts supplier Magna International Inc.
“Any impediment to seamless trade across the border between Canada and the U.S. would have a negative impact on the price of vehicles to the buying public and be negative to everybody," Don Walker, CEO of Aurora, Ont.-based Magna, said in an interview at Bloomberg’s Toronto office last week. Magna is the biggest parts supplier to General Motors, Ford Motor Co. and Fiat Chrysler Automobiles. Shipments from Canada to the U.S. account for almost 76 per cent of the country’s total exports, according to Statistics Canada. Automakers, including the Canadian divisions of the Detroit 3, and oil and gas producers are the country’s two largest exporters to the U.S. Those sectors each generated about $60 billion in shipments south in 2016, or 30 percent of the total, the government data show. Refiners followed with $12 billion in exports, then drug producers, sawmill companies and aluminum producers. “Absolutely, we need to be concerned about any change in our trading relationship with our largest trading partner,” Paul Taylor, chief investment officer of asset allocation at BMO Global Asset Management, said Thursday on Bloomberg TV Canada. David MacNaughton, Canada’s ambassador to Washington, has said his goal is to avoid becoming “collateral damage” in Trump’s trade fight aimed at China and Mexico. 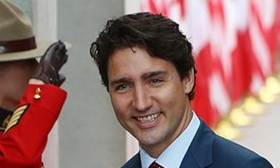 Stephen Schwarzman, head of the president’s strategic and policy forum, told reporters in Calgary last month that Trudeau shouldn’t worry too much because trade is “balanced” between the two countries. Canadian markets have betrayed little concern about a major trade upset with the S&P/TSX Composite Index rallying 7.3 per cent to record highs since Trump’s election on Nov. 8, in tandem with U.S. equities. The country’s currency has advanced 1.6 per cent over that time frame, the best-performing among its G10 peers. Still, the long-simmering dispute over softwood lumber, which wasn’t included in NAFTA, illustrates how trade irritants can fester and affect costs. Lumber prices have begun to rise recently amid "the emotion and confusion” over possible duties the U.S. may impose on Canadian product, Wayne Guthrie, senior vice president of Canfor Corp., said last week. The U.S. charges that the Canadian industry benefits from government subsidies and talks are ongoing between the countries to resolve the dispute. A border tax could backfire by raising the cost of raw materials used to make goods in the U.S., said Pierre Gratton, president of the Mining Association of Canada. “It would be counterproductive for the United States to start imposing a border tax on minerals and metals because they’d only be punishing their manufacturing industry,” Gratton, said by phone Feb. 2. The U.S. imports nickel for steel making for example, he said. Canada’s biggest metal exports to the U.S. by value, are iron and steel, aluminum, gold and copper, according to the group. Other executives say Canadian industry will adapt to any NAFTA changes. New Flyer Industries, the largest transit bus manufacturer in North America, said the company has lived in “somewhat of a U.S. protectionist environment for some time” due to the Buy America requirements for the majority of its customers, CEO Paul Soubry said. The Winnipeg, Manitoba-based company is moving toward 65 per cent U.S. content for 2018 and 70 per cent for 2020 and New Flyer is actively moving some Canadian supply to its U.S. facilities and subcontractors, he said. Energy exporters are optimistic Trump’s more positive approach to the energy industry will outweigh any increased border costs. He’s already moved to get construction of TransCanada Corp.’s Keystone XL pipeline rolling again from Alberta’s oil sands to the U.S. while the industry sees an ally in Rex Tillerson, the former Exxon Mobil Corp. CEO who’s now U.S. secretary of state. It’s that continental approach to trade that many hope Trump will come to appreciate. While having almost unfettered access to the world’s biggest economy has been incredibly beneficial for Canadian industry, NAFTA has also been a boon to the U.S, said Jean-Francois Perrault, chief economist at Bank of Nova Scotia. About 14 million jobs depend on trade with Canada and Mexico, and about 5 million of those directly result from NAFTA, he said. “There’s obviously deep integration that results from the trade between our countries that’s allowed us -- Canada, the U.S. and Mexico -- to benefit from significant economies of scale, economies of scale that might not be possible in the absence of essentially the common market," he said in a phone interview on Feb. 10.